Free Comic Book Day is right around the corner and it's a great time to bring the kids out to your local comic store, grab some great free books and maybe buy up a graphic novel or two. One of the books the kids might be interested in is Plants vs. Zombies. Dark Horse has a Plants vs. Zombies story ready for the big day AND a new series called Bully for You. Paul Tobin and artist Ron Chan join forces to uncover who’s really behind the mysterious Anti-Bully Squad. 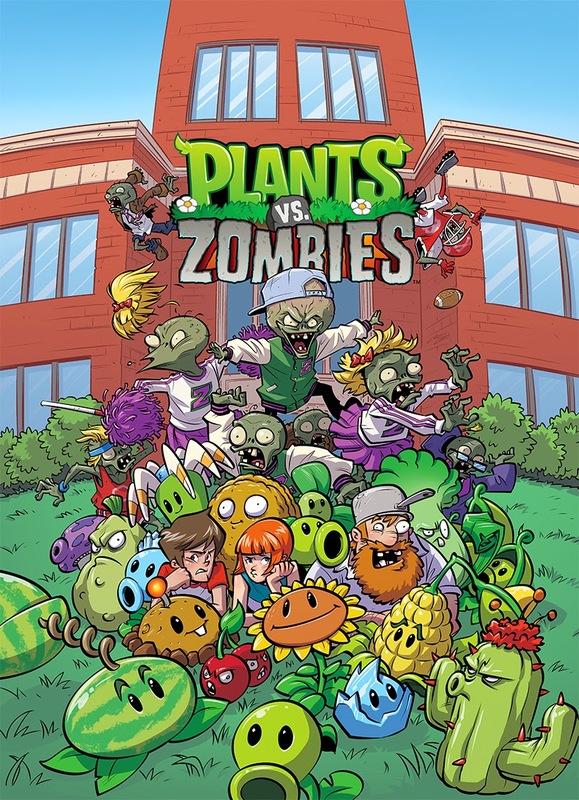 In spring 2014, Dark Horse Comics released The Art of Plants vs. Zombies. Part zombie memoir, part celebration of zombie triumphs, and part anti-plant screed, it is a treasure trove of never-before-seen concept art and material from Plants vs. Zombies, Plants vs. Zombies 2, Plants vs. Zombies Adventures and Plants vs. Zombies: Garden Warfare. In fall 2014, Dark Horse announced record sales of over 500,000 copies of Plants vs. Zombies books following multiple sellout print runs. Nate, Patrice, and Crazy Dave investigate a strange college campus to keep the streets safe from zombies. And Dr. Zomboss’s crime-filled college years are revealed! This hilarious educational escapade also features two bonus stories illustrated by Dustin Nguyen (Batman: Li’l Gotham, Descender). Future issues will feature bonus strips by Peter Bagge, Jennifer Meyer, Karim Friha, Nneka Myers, and others! ‘PLANTS VS. ZOMBIES’ MONTHLY COMIC SERIES COMING FROM DARK HORSE! FOR IMMEDIATE RELEASE: MILWAUKIE, OR—With an all-ages Free Comic Book Day story right around the corner, Dark Horse Comics and PopCap Games are thrilled to announce Bully for You, a new, ongoing Plants vs. Zombies™ miniseries coming to comic shops, beginning in June!